In its second major move against state capture, the National Prosecuting Authority has seized control of a dairy farm in the Free State and the bank accounts of Atul Gupta, companies co-owned by Duduzane Zuma and other entities in the Gupta empire, reports News24. The news organisation says it is in possession of a court order issued by the Free State High Court on Thursday that puts the Krynaauws Lust farm near Vrede in the Free State under curatorship of the NPA’s Asset Forfeiture Unit (AFU). 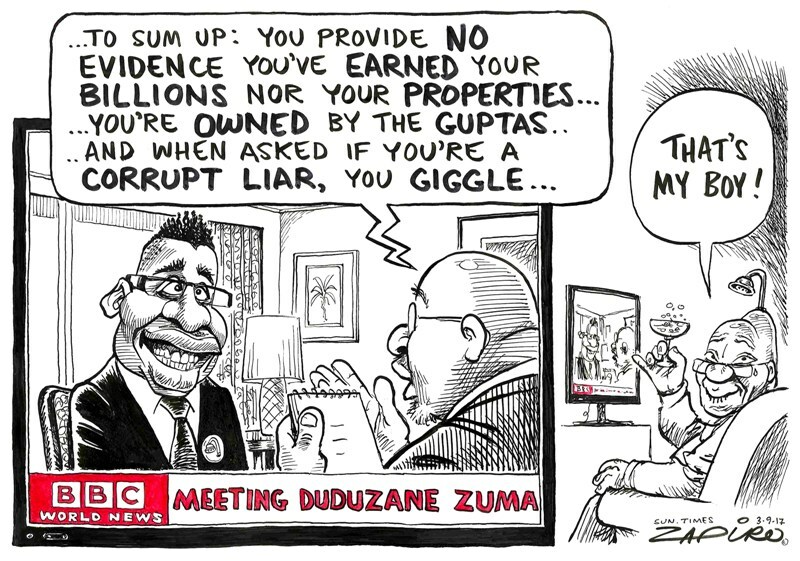 Meeting Duduzane Zuma. More of Zapiro’s magic available at his website www.zapiro.com. The documents reveal that the Free State’s agricultural department – under then MEC Mosebenzi Zwane – paid R220 million to the Guptas in what the AFU calls a “scheme designed to defraud and steal monies from the department”, says the news organisation. “This is the second in a series of court actions as the NPA clamps down on companies and individuals implicated in state capture. The first applications targeted consulting firm McKinsey and advisory firm Trillian for irregular work done for Eskom,” notes News24. “The farm, that was gifted to the Gupta-linked Estina in 2013 under a free 99-year lease by the Free State agriculture department, was one of the most scandalous transactions between the Guptas and a government entity,” reports News24. 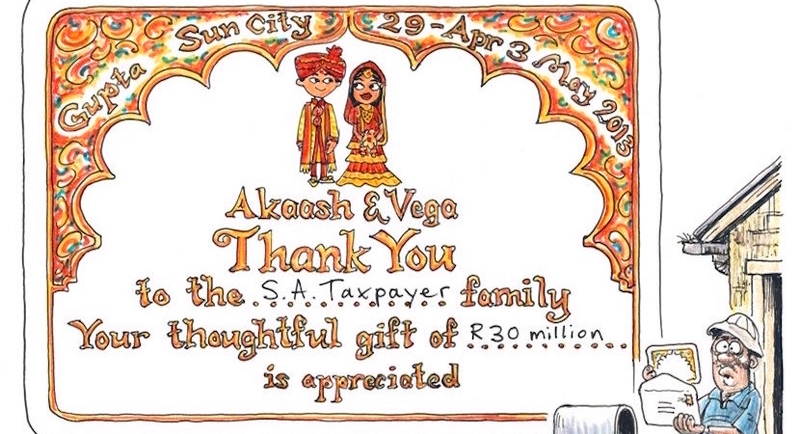 The #GuptaLeaks, a treasure trove of emails leaked from the heart of the Gupta empire and reported on by investigative journalists, provided evidence that at least R30 million paid to the Guptas via the farm ended up funding the family’s lavish Sun City wedding in 2013. 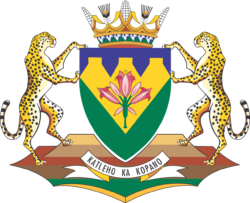 Free State Provincial Government paid R220 202 652 for the Estina farming project. Only R2 425 461.28 went to farming. The rest? Ask Atul & Duduzane. News24 reveals that in his affidavit before court, the AFU’s head of operations, Advocate Knorx Molelle, states that the farm “is the proceeds and instrumentality of unlawful activities; namely fraud, theft and corruption and money laundering”. An irregular government process, including fraudulent assistance from government officials, led to the Guptas scoring a farm they had no intention of developing, explains News24. “I submit that the entire project was a mere facade right from the outset that was aimed at providing a veil of legitimacy to what was evidently a scheme designed to defraud and steal monies from the department… the entire project, including the land it was located on, were instrumentalities of the evident theft, fraud and money laundering,” Molelle reportedly wrote. The story has been picked up by the international media. The Globe and Mail reports that “the powerful Gupta family, at the heart of South Africa’s biggest corruption scandal since apartheid, profited from a criminal scheme to loot $20-million (U.S.) from a farm project that was meant to help impoverished farmers, prosecutors say”. I bet Atul, Ajay, Tony Gupta, Duduzane and Jacob Zuma are busy developing some chronic diseases. Shaik did it, and it worked well for him (he's yet to die for 9yrs now). It notes that the allegations, contained in 120 pages of sworn statements, are the first formal accusation of criminal wrongdoing against the Gupta brothers, long-time business partners of President Jacob Zuma’s son, Duduzane. The Globe and Mail says: “In one of the affidavits, a prosecutor described the dairy project as a ‘well-orchestrated plan’ to ‘swindle’ the government. He said the farm was a ‘mere façade’ to allow fraud, theft and money laundering. The affidavits detailed how the money ended up in the bank accounts of the Guptas or companies controlled by the Guptas. A court in Free State province, where the farm is located, has authorized prosecutors to freeze the farm’s assets and the bank accounts that received the $20-million. Those assets were the ‘proceeds of crime,’ the court said. Most or all of the bank accounts were controlled by the Guptas and their companies, none of which had any connection to agriculture, the affidavits say. The Globe and Mail highlights that the allegations will have implications for Canada’s export credit agency, Export Development Canada, which loaned $41-million to the Guptas in early 2015 to help them purchase a $52-million luxury jet from Bombardier Inc. The agency has said it didn’t see enough ‘political exposure’ risk to reject the loan at the time, but it finally cancelled the deal late last year and is now seeking to recover the airplane. “Since then, prosecutors have abruptly begun acting against the Guptas, and there are growing signs that Mr. Zuma could be forced to resign soon,” it adds. Consider an example of the devastation of cross-border money laundering caused to South Africa, which may have been stopped had there been more rapid collaboration and goodwill between the relevant law enforcement authorities and the banks, including in Britain. The Free State, one of nine provinces in South Africa, is marked by miles of flat, rolling grassland and crop fields and is the country’s granary, responsible for 70% of total national maize production. Britain has played a defining part in the history of this province as it marked one of the most contested spaces during the late 19th century/early 20th South African Wars involving the British Imperialists, the Afrikaner Nationalists and the Basotho people. Today, the Free State is one of the poorest in South Africa. Nearly one in two of the people are unemployed and nearly two thirds of the people live below what is called the “upper bound poverty line”. More than half of the people in that province survive on one meal a day, tens of thousands of children go to school hungry, if they’re fortunate enough to be in school, and over half of the province’s children drop out of school before obtaining their Matric (roughly our equivalent of A-levels), primarily because their daily focus is on survival. Therefore when, in February 2013, the Free State government announced that they would spend about £18-million (ZAR340-million) to build a dairy farm in a small Free State town called Vrede, which would be part-owned by 80 impoverished beneficiaries, the local community felt a sense of hope. Some of these individuals even sold off their own livestock – in many cases their only assets – in anticipation of their participation in the project. Indeed, this kind of public-private partnership is a commendable and deeply necessary model of economic empowerment to redress the profound racial inequalities generated by the Apartheid state, which continue to reverberate throughout South Africa. But what the people of Vrede didn’t know was that this project, and therefore their village, would become the scene of a transnational money laundering crime, committed by collaborators from within the Free State government on the one side, and the now notorious Gupta’s, on the other side. Step 1: In May 2013, three months after the Free State government announced the dairy farm project, a company called Estina, ostensibly the vehicle for the 80 beneficiaries, but which was actually linked to the Gupta’s, was handed a farm to begin building the dairy. Estina’s sole director was an IT salesman with no farming experience. The project was not put out to public tender. Step 2: The government almost immediately transferred about £6 million to Estina. Step 3: Instead of investing this in the farm, Estina transferred most of this money to a Gupta company in the United Arab Emirates (UAE) called Gateway Ltd. Gateway is registered in Ras al-Khaimah (RAK), one of seven emirates making up the UAE, and a highly secretive offshore company jurisdiction. At the time, Gateway held its account with British Bank Standard Chartered, which the Bank has subsequently closed. Step 4: Once the funds were in Dubai, the Guptas engaged in a classic laundering cycle – transforming illicit money into ostensibly legitimate assets. In arguably the most eye-watering example, they transferred over £2 million of the Estina dairy money, in two separate tranches, through two shell companies, ultimately consolidating it in their Standard Chartered account for another one of their UAE-based companies, called Accurate Investments (the bank has since closed this account too). Step 5: They then transmitted this money into an entity called Linkway Trading (banked with the State Bank of India) back in South Africa. Step 6: Once in Linkway, the Guptas used these funds to pay for a lavish four-day family wedding where, among other extravagances, over £1000 was spent on chocolate truffles, £120,000 was spent on scarves for guests, and £20,000 on fireworks. Revealed! 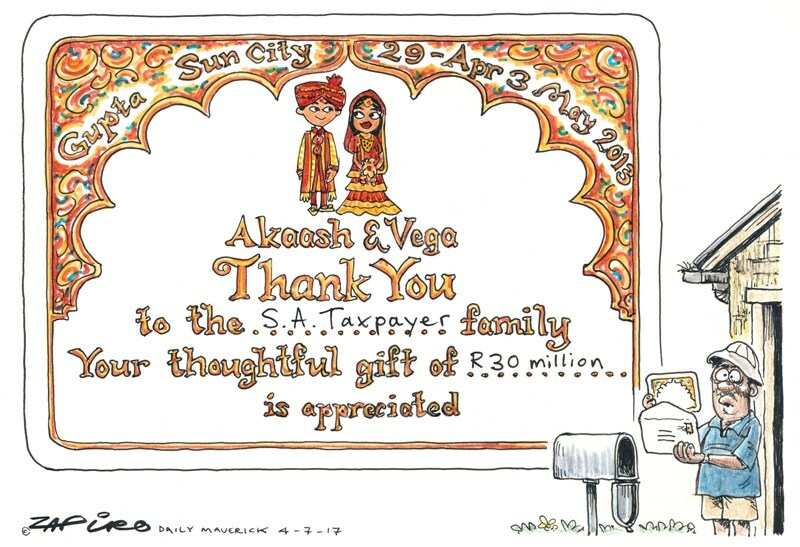 Taxpayers picked up tab for THAT big fat Gupta wedding – guided by KPMG. More magic available at www.zapiro.com. At about the same time that the Guptas were celebrating at the wedding, veterinarians in the town of Vrede were called to the dairy farm because of the reeking stench of dead animals. They found at least 30 cows that had been buried in a ditch having died from “an unknown condition that could be caused by malnutrition”, according to their report. I have detailed the Vrede dairy example, because many of us do not fully appreciate the destitution caused by money laundering. But it almost always requires the complicity, whether witting or unwitting, of financial institutions – in this case, some of those are headquartered in Britain like Standard Chartered which I am grateful is now being investigated along with HSBC and the Bank of Baroda by the Serious Fraud Office, the Financial; Conduct Authority and the National Crimes Agency following my request to the Chancellor. The success of these criminal networks also relies on the action or inaction, cooperation or non-cooperation, of the relevant law enforcement authorities. And almost always, it is the poorest who bear the brunt. Lord Peter Hain, a South African born British politician who has campaigned against apartheid and state capture, outlined the above in a speech on 1 November.